I was delighted to hear that Q-Games was making a sequel to PixelJunk Monsters. I like the whole PixelJunk line, but Monsters is a particular highlight -- it's one of my favorite tower defense games ever. 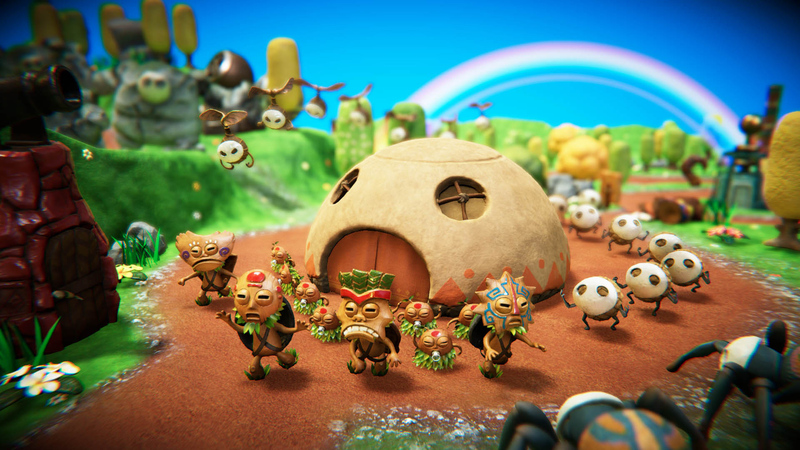 The studio has released a demo for PixelJunk Monsters 2 on PlayStation Network (North America here, Europe here, Steam here) and while it's super short -- just a single level without co-op functionality, as far as I can tell -- it's worth checking out for fans. You've got to see the cute little Chibis up close. The game looks incredible and plays like you'd expect. I mean that in a good way. As Tikiman, you'll run around converting trees into towers (arrow, cannon, and anti-air). Slain enemies drop coins and sometimes gems, the latter of which can be used to buy limited-use fruit bombs or tower upgrades. Alternatively, you can dance! Standing near a tower will slowly upgrade it (up to five tiers), but since dropped coins only stay on the field for so long before disappearing, your attention is always divided. Figuring out where to be and for how long is the name of the game. The demo lets you run around in a hub world, albeit with some gates to keep you from exploring too much, and you can spend currency earned from clearing levels and reaching milestones on new masks and shells. I feel like this game will shine the most in co-op (local and online in the full version), but the demo makes a strong impression. The sequel's move to 3D feels like the right decision. PixelJunk Monsters 2 is coming to PS4, Nintendo Switch, and PC on May 25 for $15.